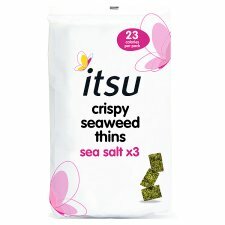 Seaweed, the green superfood, naturally packed with nutrients, zinc, iron & B vitamins. Seaweed's superpower is its great source of iodine, a nutrient missing in most other food, critically important in regulating hormones. 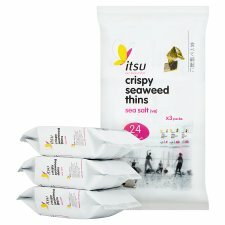 itsu's best-selling crispy seaweed thins are harvested from the crystal clear seas around South Korea. Heralded as the new, butterfly light vegetable crisp, they are the perfect eat beautiful snack.